At 10:30 AM.Arrival to Cairo airport, The Egypt tour representative will assist through passport control formalities, luggage identification & portage. 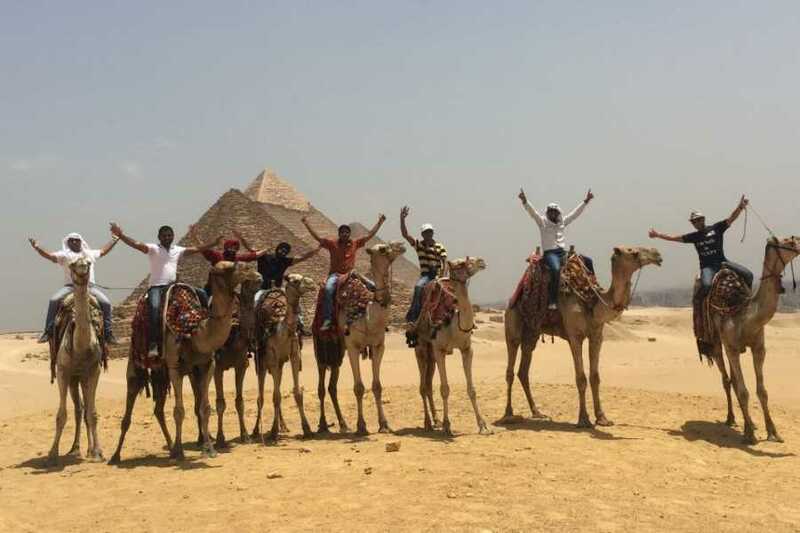 From the airport you will be transferred by a private A/C Mini Bus to start the Cairo city tour. At the end of the Cairo city tour, we will transfer you back to the airport to take domestic flight to ASWAN. Local domestic flight Cairo to Aswan. Breakfast at the hotel then around 3:30 am transfer to Abu Simbel. Arrival to Abu Simbel around 7:00 am visit the Temple of Abu Simbel. Nearby, also saved, lies the small Temple of the King's wife Nefertari, dedicated to the goddess Hathor. At the end of the Tour Transfer to Luxor where it`s 300 KM from Aswan, about 3 hours drive. Arrival at Luxor, transfer to your Hotel Check in. Breakfast at the Hotel then at 7:00 am start your Full Day Tour to West Bank visiting Valley of Kings, Deir El Bahari Temple, Colossi of Memnon and the Temple of Queen Hatshepsut. Excursion to the Necropolis of Thebes, on the Eastern bank. Crossing the Nile, drive to the Valley of Kings; visit the tombs of various Dynasties, The Temple of Deir El Bahari. On the return journey stop at the Colossi of Memnon which are two gigantic sitting statues representing Amenophis III facing the Nile. Visit the Temple of Queen Hatshepsut. Then visiting East Bank visiting Karnak and Luxor Temple. Excursion to the Luxor Temple to see its courtyard and the granite statues of Ramses the Great Proceed by carriage or bus to Karnak, which is a serious of temples, built indifferent reigns. Starting by the Avenue of Sphinxes visit the Unfinished Propylon, the Hypo style Hall with it's 134 gigantic columns, the Obelisks of Queen Hatshepsut and Tutomosis III, the temple of Amon adorned with lotus and papyrus designs, the Granite Scarbeus of Amenophis III and the Sacred Lake. At the end of the Tour, transfer you to Luxor airport for your domestic Flight to Cairo. Arrival at Cairo airport and transfer to your Hotel Check in. Breakfast at the Hotel then at 7:00 am Pickup from your Hotel and Transfer to El Baharya oasis where it`s 380 K/M from Cairo. Arrive to El Baharya Oasis around 10:30 am, change the Mini Bus into a 4*4 Vehicle and take the way towards the Black and white desert where you can enjoy the whole day till 16:30 pm. Around 17:00 pm Return Back to El Baharya Oasis, take the Mini bus and take the way Back to Cairo Reach Cairo at 20:30 PM. Breakfast at the Hotel then Start your full day tour visiting the Great Pyramids - Cheops, Chephren & Mykerinos then Visit the Valley Temple where the Priests Mummified the dead body of King Chephren. Also there you will have a close-up look at The Sphinx - The legendary guardian that stands by the huge funeral complex with its lion body and the head of king Chephren. Then Visit Sakkara, located only 27 km southwest away from Cairo. Visit the Step Pyramid (Built for king Zoser). 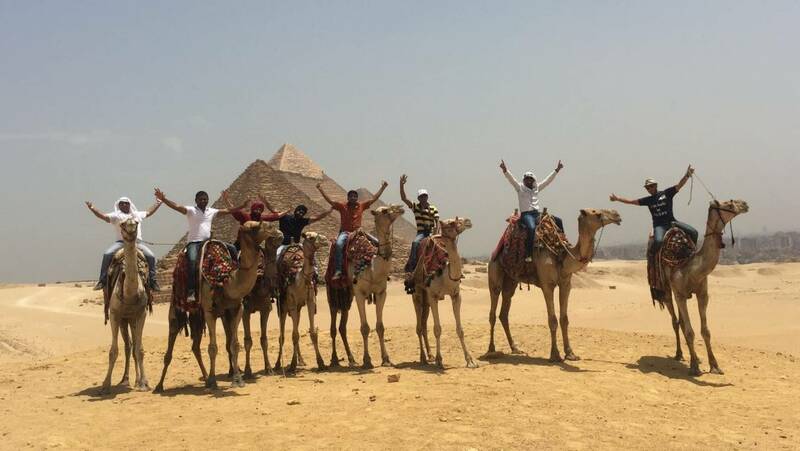 Then Visit Dahshur Pyramids. Dahshur area is a royal necropolis located in the desert on the West Bank of the Nile approximately 40 kilometres (25 mi) south of Cairo. (Optional not included) 45 $ P.P Dinner Cruise including transportation, dinner, Belly Dancer, Tanura Show. Transfer to Cairo airport for our international flight out from Cairo and assist you at the Check in Procedures. To be at the airport at about 2.5 hours prior to the schedule departure time below.